MCAA and MSCA members can now access some of our most valuable publications on our new WebBook platform. You will be able to read Management Methods Bulletins and other resources, take notes, print sections, and share with colleagues. And most importantly, when we have updated content, unlike a downloaded pdf, our WebBooks can be instantly updated behind the scenes while your notes are preserved securely on your computer. 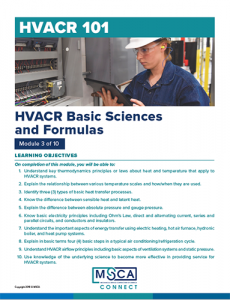 Of specific interest to MSCA members are the extremely popular HVACR 101 modules, which have been converted into WebBooks. This new platform helps individuals maximize their learning experience. Each WebBook contains the relevant course material and quiz at the end. Please be sure to visit BIG BUTTON BELOW to check out the current WebBooks. Modules will continue to be updated as they are completed. To go to the WebBook Library and get started, click the BIG BUTTON BELOW!